Today sees the trending of Fat Cat Tuesday on social media platforms, accompanied by ubiquitous photos of mega moggies and fat fluffies. Unlike #Caturday, which is devoted to real cats, the hashtag #FatCatTuesday is actually about FTSE100 bosses earning more by the end of today, the fifth day of the year, only the second working one, than the average UK worker in a whole year. 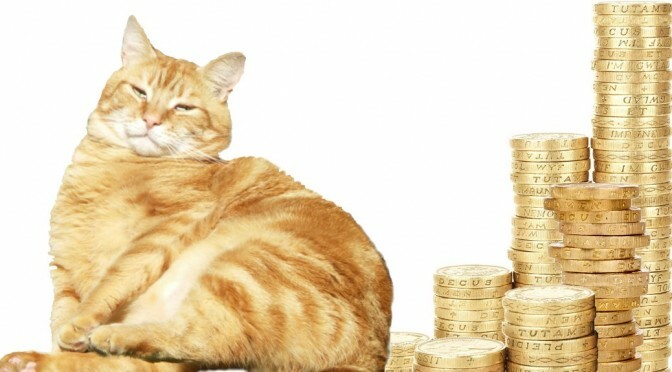 In fact, they could knock off early, sometime this afternoon, having earned £27,645 – the UK average salary, in less than two working days, according to the High Pay Centre, which has labelled today ‘Fat Cat Tuesday’ and launched a compare-your-pay counter online. Britain’s top executives make an average of £4.96 million a year and even assuming long hours, rare holidays or weekends off, their average hourly pay is still more than £1,260, nearly 200 times the minimum wage of £6.70 and easily 200 times the wages of those who build the skyscrapers in the City of London or the nurses that treat them in A&E. Assuming they do play golf at the weekend then it is over 200 times the basic guaranteed UK wage – voted the most successful government policy of the last 30 years. These levels of pay inequality, whilst legitimate in a free society are nonetheless abhorrently unethical and unnecessary. Who needs £1260/hour to live off, that’s £20 a minute. Whatever the crime, you’d expect a lawyer charging that much would get you off scot-free. In fact, many people earning these figures employ accountants and lawyers to find ways to avoid paying taxes on their exorbitant earnings. The phrase ‘scot-free‘ has little to do with the Scots and everything to do with the Scandinavians and the French – linguistically, at least. The word comes from Old Norse and French escot which came into Old English as sceot, meaning “a payment, lot, portion or share”. Some merchants and nobles were given a tax “get out of jail free” card absolving them from paying, then royal, taxes, leaving them ‘lot’ or scotfreo – ‘scot’ free. It’s an ethical economics catch-22 whether everyone earning more is better than nobody being paid disproportionately too much, in other words should we work on raising minimum wages irrespective of maximum wages, or whether it is the imbalance itself that is the problem. There are so many small-print ways of evading a suggested or mandated pay ration, what it boils down to is that an ethical company would want to observe such a policy whether it was law or not. Fat Cat Tuesday is so shocking that it should lead to fewer fat cats and more healthily average-weight and salaried employee kittens across the board!